I have the psychological addiction to smoking in the worst kind of way. I’m working crazy hard to finish my Master’s Degree and I can’t even think of stopping until I finish in January. Then I really have to learn to deal with this problem. I hope it’s not too late. I’m sixty-seven years old and have been smoking off and on all my life. It really makes me feel horrible and I want to live the rest of my life in as good health as possible. What make The Complete Quit System different than everything else I’ve tried? And, believe me, I’ve tried everything. You sound exactly like me several years ago – I had tried ‘everything’ to quit, with no success. I was starting to despair that I would ever be able to quit, and I didn’t know what to do next. I was starting to think I was going to die a smoker… and probably sooner rather than later! So first, let me reassure you that it is not too late. It doesn’t matter how old you are, or how long you have been smoking – you CAN quit, and it will vastly improve your health and your life. I know of at least one woman who was 70+ years old, who had been smoking for more than 50 years, and was up to five packs a day when she used this program to quit. If she can do it, you can, too. Second, you mention that you are psychologically addicted. Knowing that, I can tell you that most of the things you have tried didn’t really have much of a chance to help you quit. Why? Because most things on the market deal mainly with the physical addiction to nicotine, not the psychological dependence on smoking. It’s the psychological addiction that keeps you coming back to smoking, even if you’ve quit for several days, weeks, months, or sometimes even years. So the short answer about what makes The Complete Quit System different from what you’ve tried is that it focuses almost exclusively on the psychological addiction. Of course, it does deal with the physical addiction too, with a simple and natural nicotine fading technique, similar to what is used for ‘harder’ drugs. This is the exact opposite of most methods, which focus primarily on the physical addiction to nicotine, with little or no attention paid to the main problem – the psychological dependence. The longer answer to ‘what makes this program different’ involves a psychological breakthrough that changed our entire understanding of how people think. A little more than 10 years ago, psychologists found conclusive evidence for the existence of two cognitive systems in the brain. These two systems work very differently: One functions according to strict rules of logic, while the other one works to assimilate our experience using rules of association. Prior to this discovery, we tended to think about ‘rational’ vs. ‘irrational’ thought, believing that rational thought was good, and irrational thought was simply erroneous thinking, to be avoided at all costs. Now we know that our ways of thinking can more accurately be categorized as rational and experiential. More importantly, we now recognize that experiential thinking also follows a set of predictable rules – they’re just different from the logical structures followed by the rational system. So how does this relate to trying to quit smoking? Many methods for quitting – even those that try to focus on the psychological aspects – focus on the WRONG cognitive system. For instance, programs that simply have you write down reasons to quit, or that educate you about all the diseases you’ll get if you keep smoking are essentially focusing on the rational reasons you should quit smoking. You already know this doesn’t work to help you quit smoking, don’t you? The reason it doesn’t work is because these strategies focus on the rational cognitive system, but your desire to smoke is controlled by your experiential system. Some people are able to quit this way, if they have a whole bunch of will power. But the problem is, you can’t get rid of your desire to smoke by influencing only your rational system. The truth is, to get rid of your desire to smoke, you have to influence your experiential system, too. And that’s the second thing that makes my program different: As far as I know, it is the only quit smoking program in the world that focuses on influencing the experiential system in order to get rid of the desire to smoke. It’s a step-by-step program, not ‘advice’ about how to quit. The program manual tells you exactly what to do to prepare before you even start to quit. On Day 1 of the program, you are approximately two weeks from quit day. The manual tells you what to smoke, when to smoke, and how to smoke between days 1-5, Days 6-10, and Days 11-15. Day 16 is your first smoke-free day – and it will be nothing like quitting cold turkey. You’ll be prepared for it, virtually free from nicotine addiction already, and most of the way through any withdrawal symptoms you might experience, before you actually quit smoking. You also learn what to do after you quit. Days 16-20 you get explicit guidance about how to care for yourself after you quit, including how to avoid weight gain and how to get closure around smoking. Days 21-25, you find out how to deal with problem areas like friends who still smoke. Days 26-30 you begin the process of ‘reinventing’ yourself to become more of who you are, only better. Along the way you’ll use principles of classical and operant conditioning to eliminate the power of smoking ‘triggers,’ you’ll discover how to proceed through the grief process and avoid getting trapped in the stages of anger or depression, and you’ll learn techniques to ‘inoculate’ yourself against the risks of going back to smoking later. 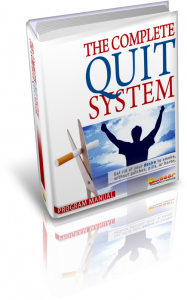 The Complete Quit System has everything you need to quit successfully – including a money back guarantee, for your peace of mind. E-mail and phone support is included in the program. Nothing else is required to be successful, but if you feel strongly that you really want the help of prescription meds or something else, most stop smoking aids can easily be combined with this program. It has a money back guarantee, good for an entire year. If you don’t think the program is worth what you paid for it, you let me know, and I give you your money back. Simple as that. I’m going to do a limited time special for folks reading this blog – look for the link below to check it out. If you still believe there might be a magic pill out there for you, you’d better keep looking. But if you’ve decided you really do want to quit, and you’re willing to devote a few weeks to earn a lifetime of freedom, then by all means, hop on. If you’re ready to quit smoking, I really can help you. But you have to take the next step. I LIKE TO TRY. I’VE TRIED EVERYTHING ELSE. Click the ‘take the next step‘ link to check out the special I’ve put together for my blog readers. It includes a free preview of the program so you can check it out before you commit to it. Whatever you decide to do, good luck to you! Thanks so much. I keep visiting your e-mails, and have to admit I’m frightened. I’ve tried everything I know to be free of this lifelong habit. I’m 62, a professional woman (ABD)–and all my friends keep telling me I can do anything I put my mind to (and they don’t understand how an intelligent woman can keep smoking when I know what it will do to me). Yes, I’ve tried programs, Chantix (an emotional disaster), two round of hypnosis, etc. and basically feel “weak” when it comes to giving up my lifelong cigarette habit. I do want to WANT to quit–but I must not want to badly enough if I continue to smoke after all I’ve tried. Any hope for me with your program? Your situation sounds very similar to mine before I quit – my friends all believed me to be a strong-willed person who could do pretty much anything I really wanted to, and I believed that of myself, too. So we were all perplexed about why I couldn’t quit. I realize now, of course, that this isn’t about will power at all – there are a LOT of things going on psychologically, and once you have the tools to deal with them, it gets considerably easier. So yes, I do think there is hope for you with my program. And since it comes with a 12-month money-back guarantee, you can find out whether it will work for you with no risk at all. I have severe COPD. Have been trying to quit for l0 years. Have tried everything and have quit for short periods of time, but go back to smoking. Am desperate. I need help bad. The more I think about quitting the more I smoke. Please Help! I have severe COPD. Have been trying to quit for l0 years. Have tried everything from pills to hypnosis which was a big waste of money and time. I Am desperate amd need help bad. The more I think about quitting the more I smoke. I have been in and out of the hospital several times since 2002 due to my COPD. When I get out the first thing I want is a cigarette. My mother died from COPD and I am following right behind her if I don’t do something. I only smoke 1/2 to 1 pack when I’m home, but work is another story. I have a very stressful job, which I am driving most of the day, and will smoke 1 1/2 to 2 pks a day when working. I’ve tried to tell myself that I don’t need one, but then I think, I’ll have just one and then wait longer for the next one. But, of course, I don’t wait. Do you think you can help me? I have no where else to turn. You clearly need to quit, and based on your lack of success with prescription medication, and the fact that you have been trying to quit for 10 years, I think it’s safe to say that your addiction has a significant psychological component. The Complete Quit System focusses mainly on the psychological aspect of smoking addiction, so there’s a good chance that it would work for you when nothing else has. Click the ‘take the next step‘ link to learn a bit more about what the program entails. Previous post: I’m an emotional wreck when I quit. What can I do?